A young Oakland man arrested last year on terrorism-related charges conspired to kill 10,000 people across the Bay Area by blowing up gay clubs in San Francisco, planting backpack bombs on the University of California, Berkeley campus, setting fire to the Berkeley Hills and selling cocaine laced with rat poison, according federal court records obtained by NBC Bay Area. NBC Bay Area’s Investigative Unit first broke the news that Berkeley High School graduate Amer Sinan Alhaggagi, 22, was indicted late last week for attempting to provide support to the terrorist group ISIS. During a December detention hearing, federal prosecutors recounted in detail conversations dating back to last July that Alhaggagi had with FBI informants posing as ISIS sympathizers. But Alhaggagi’s attorney at the time argued his client never actually intended to commit those atrocities. “The real ultimate issue is how much of these allegations are very stupid and very inappropriate and very disturbing puffery, and how much was intended to be acted out,” Federal defender Hanni Fakhoury said during the hearing. 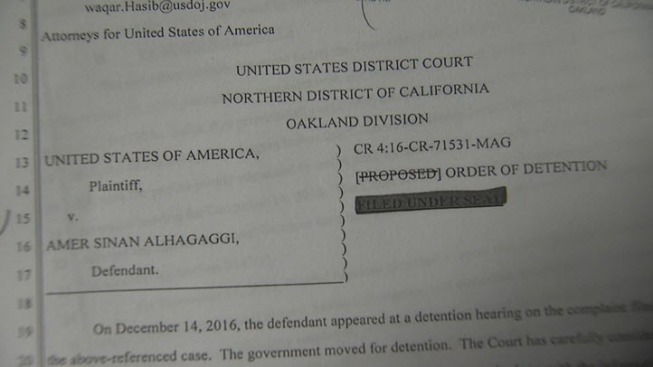 During the detention hearing, they said Alhaggagi met face-to-face with an undercover FBI agent posing as an ISIS sympathizer, taking him on a tour of the Bay Area and pointing out possible targets for an attack. He also provided three backpacks that could be used to carry bombs to the undercover agent, according to federal prosecutors. When federal agents served a search warrant at Alhaggagi’s residence, prosecutors say they found a bomb making manual on the desktop of his computer. At one point, prosecutors say Alhaggagi even asked an undercover agent if he should kill his own friends. According to prosecutors, Alhaggagi planned to flee to Mexico after carrying out those attacks. From there, prosecutors say he planned to join Islamic State fighters abroad. Despite those disturbing conversations, Fakhoury said his client’s actions tell a different story. When prosecutors brought up a trip to Saudi Arabia they found concerning, Fakhoury said Alhaggagi was merely attending his sister’s wedding. Prosecutors alleged Alhaggagi told an undercover agent he’d purchased rat poison using stolen credit cards, but Fakhoury said federal agents never found evidence that actually took place. When prosecutors claimed Alhaggagi intended to use stolen credit cards to purchase materials for terror attacks, Fakhoury said the only items his client actually bought with those stolen cards were clothing from an online retailer. “There’s a disconnect between his words and actions,” Fakhoury said. During the hearing, federal prosecutors discussed how they were able to track the disturbing online comments to Alhaggagi. Initially, undercover agents in communication with Alhaggagi were unaware of his true identity or where he lived. However, remarks about wanting to set fire to the Berkeley Hills gave investigators their first clue Alhaggagi lived in the Bay Area. When Alhaggagi allegedly claimed he would join a local police department to steal weapons if he couldn’t make bombs himself, investigators began contacting Bay Area law enforcement agencies. They eventually found an application Alhaggagi submitted to the Oakland Police Department. When an undercover agent met with Alhaggagi for the first time, they confirmed he was their suspect. But a few months later, prosecutors say Alhaggagi cut off communication with those undercover agents. Agents ultimately arrested him on identity theft and fraud charges relating to the online clothing purchase he made using a stolen credit card. They eventually added the charge of providing support to a foreign terrorist organization. Alhaggagi’s family said in a written statement given to NBC Bay Area that he loved this country and never intended to carry out a violent attack. Alhaggagi’s arraignment has not yet been scheduled. NBC Bay Area will continue to follow the story and provide updates as more information becomes public.